Pacific Gas and Electric Company took the first step towards developing generation projects that could convert the abundant wave energy off the coast of Mendocino and Humboldt Counties (California) into electricity by filing two preliminary permit applications with the Federal Energy Regulatory Commission (FERC). The WaveConnect projects will begin with resource, environmental, and ocean use studies and if developed would use wave energy conversion (WEC) devices to transform the energy of ocean waves into clean, renewable electricity. If fully developed, the projects could each provide up to 40 MW of clean renewable electric supply. This would be the first application in North America for a project that would allow multiple WEC device manufacturers to demonstrate their devices on a common site, which could help accelerate the development of wave energy technology. 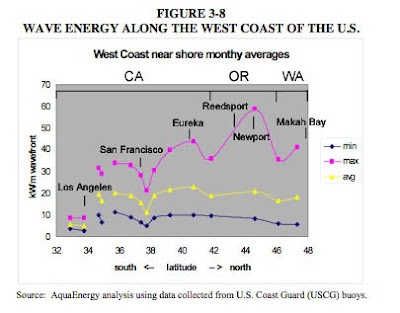 Most of the WEC devices currently being considered by PG&E float on the ocean surface and generate electricity when waves are present. PG&E, as the lead developer, will be responsible for the permitting of the sites and will encourage the participation of multiple WEC device manufacturers in the projects. Phased development of the sites would proceed if technical results support feasibility, environmental studies show that any significant impacts can be fully mitigated, and stakeholder considerations can be satisfactorily addressed. Working closely with stakeholders, PG&E will take a leading role in identifying and mitigating any potential impacts to the marine environment in order to maintain the beauty and diversity of coastal waters. PG&E, working with environmental agencies and consultants, will undertake studies of the water resource and its various ecosystems. The project will be designed to minimize effects on the environment, coastal processes, and ocean users. can you provide a link to your source for that data?